This post is the ninth edition of a 20 posts collection with the analysis in describing the connection of Renewables (Solar PV & Wind) world market with the Mining industry (extractive industries). We will check the production of metals, industrial and construction minerals to build solar modules and windmills around the world. At the end of the article, you can find the links to the other pieces of the collection. 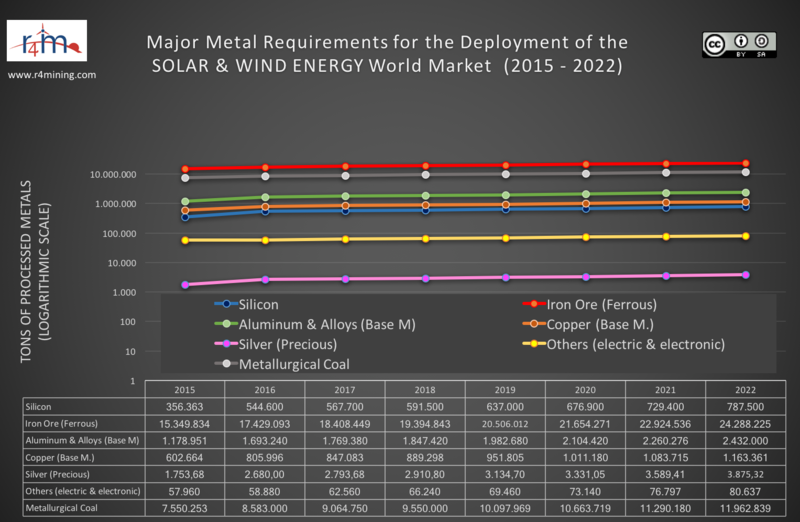 In the following article, we will analyze specific metals and industrial minerals; however, in the present section, we are focused on the requirements for metals to build world solar PV and wind energy facilities. Ferrous metals: 108.78 million tonnes of Iron Ore meaning the 84.78% of total metals. 10.62 million tonnes of Aluminium, meaning the 1.72 % of total metals. 5.1 million tonnes of Copper, 2.16% of total metals. Ferrous Metals (Iron Ore): 7,723 USD million, up to 5.47% of the total metals business market. Solar-grade Silicon: 63.313 USD million up to 44.85% of the total metals business market. Aluminium: 22,433 USD million, meaning the 17% of the overall metals business market. Copper: 35,930 USD million, 27.22% of the total metals business market. Precious Metals (Silver): 9,179 US million, the 6.5% of the total metals business market. Level “going to” 10 thousand tonnes of Silver. Following two images, source IRENA 2017 data and Vestas 2015, we build an equivalent matrix between tonnes of minerals and metals with MWp for solar and wind energy facilities. The item “oil derived products” includes plastics. Energy, including fuel and electricity, for strong elements involving the needs for minerals and metals, is a complex subject for discussion. We have to include not only the energy requirements for mining but also to transform into other products as metals or glass. We use the following source of information to determine the energy to take (on average) to produce 1 kilogram of the following materials in Lower Tech Magazine. The Silver Institute is the data source for Silver size and market evolution. Under following article (10 of 20), we will analyze the demands for NON-METAL MINING for Global SOLAR PV Marketplace.